Home Healthy Feet Runners Toe? 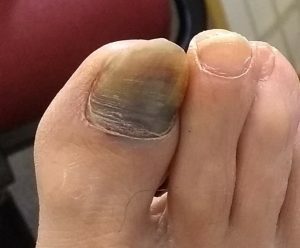 Anyone who has ever done any serious running or hill walking will have encurred a damaged or black toe nail at some point, often referred to as Runners Toe Nail. Footwear is a big contributing factor to these. They can be very uncomfortable at best and very painful at worse, not to mention making you self-conscious if you are about to get your holiday feet out and sit by the pool during that well deserved holiday you've been looking forward to. CAUTION - This article contains photo's of toe nails. Please note this article contains photo's of a damaged toe nail, before and after a treatment. 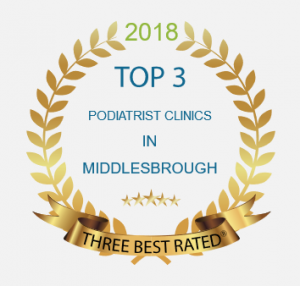 As podiatrists we see and deal with these types of nails day-in and day-out, and give patients a great deal of satisfaction and comfort from our treatment. HOWEVER, some more sensitive people may not wish to view the images, so click here to return to my home page. Before I go further, I would like to give my thanks to my patient, who very kindly let me take and use the photo's of their toe in this article. It's always a great opportunity and a priviledge to be able to share such images and education on what can be done to help people, and without the consent of my patients, this would not be possible. So how do these occur? 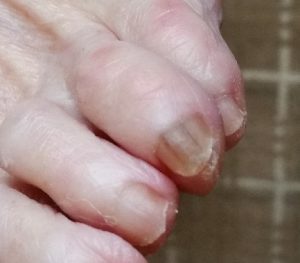 Most 'Black Toe Nails' have been caused by trauma of some form, and will normally affect either the whole of the nail, or at least the majority of it. You normally have a recollection of an event, such as pushing yourself on a long run, possibly with some steep down-hill route, or going on a long hill walk, where you've felt your toe press against the end of your walking boots. Other reasons can be from something as simple as dropping something straight onto your toe nail, or quite often someone standing on your toe, such as a grand-child or mans-best-friend - your 'always happy to see you' family dog! Why has the toe nail gone Black? What's actually happened is this case is the toe nail has been repeated pressed against the end of a walking boot, and has slightly dislodged the nail away from the nail bed (the part of the toe where the nail grows from), causing a bleed to occur from under the toe nail. 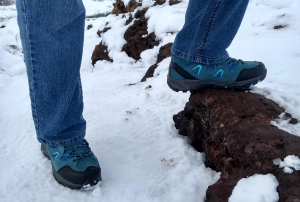 This is more common when going down hill, as the footwear grips the ground and your feet slide forward inside the footwear. Although this is more common when the footwear is either too tight or too large, it can occur in correctly fitted footwear as well. With runners, you are probably putting 3 x your body weight down into each step (allowing for the return forces of gravity), and with longer runs in bad or worn / unsupportive running shoes, this has a higher chance of occurance, along with stresses to the rest of your legs and feet (but that's another blog for another day). Treating a blackened toe nail will depend on what state the nail is, in relation to the toe. Is the nail loose or lifting? Quite often with trauma to the nail, it will lift and be loose, usually being held on only towards the edges or the part closest to the nail-fold. When this occurs, it's best to have the loose part of the nail cut back, to prevent it being caught on footwear, socks, or bed linen. If it gets caught and pulled off, you can get further bleeding and damaged, and removing as much of the nail as possible (in a controlled method) is the best option. When the old nail has lifted, a new nail will be growing underneath, and having an existing nail still hanging on above will cause further trauma to the new nail everytime pressure is placed on the top nail. This will repeatedly squash the new nail, and cause it to become deformed as it grows. Cutting the old nail back will allow the new nail to grow more healthily. 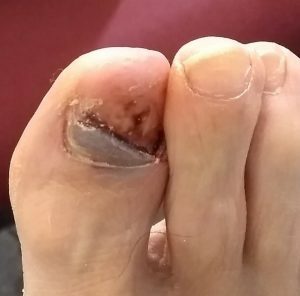 If you are out walking and this injury occurs, the best advise is to protect the toe and nail by applying an elastoplast round the nail to hold it onto the toe (not too tight in case of any swelling), to stop further trauma, and seek professional intervention (a podiatrist) as soon as possible. Is the nail still intact? If the nail is still firmly stuck to the toe, not loose, and not feeling as though it is about to come off, then the easiest way to manage the nail is to simply keep it cut as short as possible, preventing further trauma to it from the footwear. Sometimes a trauma's nail will become loose when it is being cut or sanded down, allowing it to be removed, making way for the new nail to grow through. In most cases, a new nail will regrow back, and look perfectly normal again. The first regrowth can be slightly distorted if it has been damaged further by the old nail, however, longer term it should grow back to the full length and smooth. Nails normally grow at the rate of appoximately 1mm per month, so if you damage or loose your big toe, which can be anything from 12-15mm long, it can be over a year before a new nail has fully grown. If your nail is growing back, but the surface is uneven, and podiatrist may be able to smooth it down, reducing further risk of damage. Can I paint my black nail to hide it? I would always seek professional help with a blackened toe nail before painting it. However, once you have the all-clear, there is no reason why you shouldn't pain them whist it is growing out. Always keep your toe nails cut short, and smooth. If you have longer toe nails, they are at increased risk of trauma. 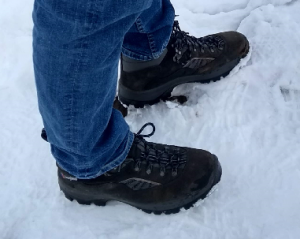 Always make sure your footwear is the correct size and width for your feet. You can save money by buying from the internet, but sizes can vary between different manufacturers. 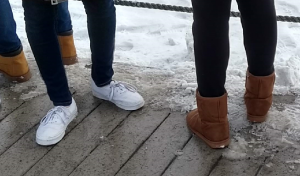 I always recommend trying footwear on before buying. And never wear new footwear stright out of the box for a long walk or run. Always wear them in gradually. See my article on shoe sizes. My nail is discoloured, and I don't remember any trauma! There can be any number of reasons why a toe nail is discoloured. Trauma is the most common one, however, other problems can occur. If you do notice anything unusual regarding your toe nails, or any problems with your feet, always consult a HCPC Registered Podiatrist. If you have any questions or queries regards feet or foot health, please feel free to get in touch or book an appointment with me.